In 1991, I received my first rug from Nancy, a 32" by 54" blue, with red accents and a fringe. It has been in various places in my house, at times with a fair amount of traffic, but mostly in my bedroom where it gets use, but not heavy use. It really looks as good as new, hasn't faded, and is easily kept clean. I always appreciate the feel of a wool rug, walking on it with bare feet. The second rug I got was in 2007, 30" by 52", a much more dense rug with vivid colors, and one that is reversible. 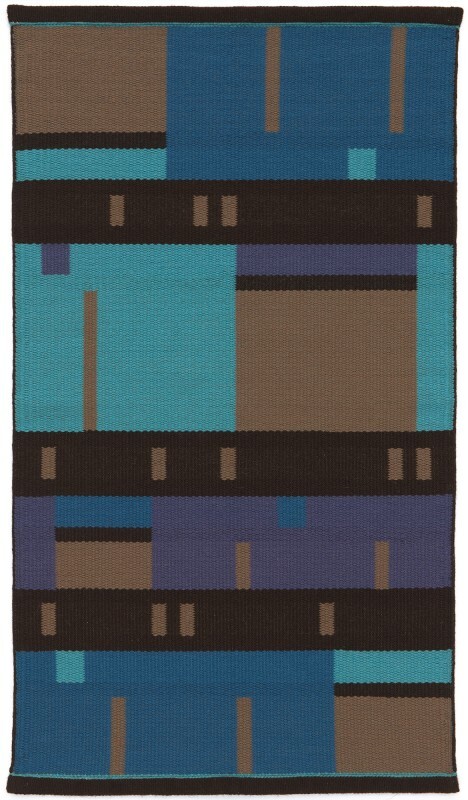 I love this rug because of the colors, the tightness of the weave, and the ease in caring for it. Once a year I treat it with a stain repellant and then just vacuum it when needed. The third rug was a major investment in 2010, a rug for my living room, 52" by 85." This rug is very colorful, with designs worked out over a period of several months. Nancy offered several design models, and we negotiated the patterns and colors to get the rug I wanted. I'm extremely pleased with this rug, the colors, the patterns, the size, and the durability. Because it is in a high traffic area, it has constant use by my cat and dog, as well as visiting dogs. It has had wine spills and other food dropped on it. Despite this use, there are no stains and no signs of wear. That speaks to the quality of the material and the tightness of weave. I do treat the rug with a stain repellent.